The one in which we tell stories of how things came into being. A solo album is a misleading name. I did not make the Living Creatures Project all by myself. There were many amazing and cool people who came into my life at just the right moments in time to hand me a precious piece of this fragile puzzle I was hoping to put together. Making a record is like putting a crazy jigsaw together, but one where there is not a picture on the box; there isn’t even a box. In fact, the pieces are spread out all over your life and you will spend most of your time looking for them while trying to remember what it is you are building. Then God sends people to hand you the important corner pieces, and remind you of what you are making. This is the first in a series of articles where we will meet the people behind the Living Creatures Project, find out where the project came from, learn where the songs came from, and other behind the scenes explorations. I had lost my taste for Christian music. Although I had been really into it as a new believer, and for several years had loved listening to rock music from the worldview of a Jesus follower, one day I woke up and couldn’t stomach it anymore. It suddenly seemed like the sub-culture of CCM was nothing more than a mediocre, family friendly, Rated G, incredibly plastic, lame knockoff of real music. It seemed like mere propaganda. It occurred to me the only reason to call music “Christian” was as a marketing strategy to sell it to lukewarm sheep. I had been writing music from a Christian perspective, and aspiring to be a “Christian artist” for several years, but suddenly I just couldn’t do it anymore. The whole thing was just too embarrassing and ridiculous. I no longer wanted to be the Christian Contemporary Music Artist, Frank Hart; I just wanted to be Frank Hart, listen to my songs if you want to figure out what I believe. Sometimes people were offended when we refused to be labeled as a “Christian band.” They accused us of denying Jesus, trying to be cool and worldly. Other people heard rumors that we were Christians and so were not able to take our music seriously. To them we were one of those weird “Christian Rock Bands” that weren’t about music, but rather about selling Jesus and magic unicorn dust. They were suspicious that we were either the rock band equivalent of Diet Twinkies, or trying to convince them to join a cult. The best we could hope for with this crowd was to be “pretty good for a Christian Band.” Not exactly what we were shooting for. We were too secular for one group and too sacred for the other. In some ways the paradox amused me and I encouraged it. I would become the delighted contrarian in an interview, making sure they couldn’t put me in either box. As an artist I tend to think of myself as a professional enigma, so this fed the ego of my inner nonconformist. One day I came to a grand climactic conclusion on the subject; there is absolutely no valid reason for Christian music to exist. There is just music. Not Christian music. Not secular music. Just music. I said it out loud in a conversation with a friend, and I was pleased with my declaration and insight; it rang true for a few seconds. Then I had another thought; What about sacred music? Is there really not a place for music that is intentionally written to be used in a sacred setting? Oh, crap. Ever have a moment like that? A moment where you lift your index finger and declare something to be true, then suddenly realize that what you have said is absolutely wrong? I’ll admit it, I have those moments all the time. I realized what I had grown to dislike about the “Christian Music” industry was how it was a ghetto of mediocrity; smilie, cardboard cheerleaders for plastic Bible bookstore sentimentality. I was suddenly convicted to the heart. I’m a songwriter and a Christian, I need to be willing to use my talents for God’s glory and the blessing of His people. There was definitely a place for specifically sacred music. I felt compelled to start writing music for use in congregational worship settings. Every culture has its own music, and as a follower of Jesus, and a songwriter, I came to believe one of the things I should spend my life doing is writing sacred music for worship. So, that’s where these songs came from; the desire to write indigenous sacred music for God’s church. By indigenous I mean the music of my people; ROCK FREAKIN’ MUSIC. I’m the music director at CrossPoint Church in Katy Texas. My job is to choose what music we use in worship and make sure we perform it as well as we are able. I am the curator of the art our congregation will experience in our worship services. Music sets the mood and tone of the service, but it does much more than that. The songs we sing together form our community; the words we sing inform what we believe about God; I believe the music we use in worship is sacramental, it is a temporal thing, instituted by Christ, that God uses to impart grace and to connect His people to Himself; music is more important than many of us would give credit. So, how do we decide what music to use? Are we just trying to appeal to people’s tastes? Are we self-indulgent hipsters who merely play what we think is cool? Are we self-obsessed narcissists who only sing our own songs and dance to our own rhythms? Are we cultural and historical snobs who only play the most current, or the historically pure songs of our tradition? We think it is more faithful to use songs from the past, present and future. We sing the songs the church is singing all over the world; the songs by Chris Tomlin, Matt Redman, Hillsong United and other popular songwriters. We sing the songs the church has been singing for centuries; the great hymns of the congregations that have come before us. Songs from the present and songs from the past. C.S. Lewis says a person should read an ancient book for every modern book they read, he says the old books don’t have our current cultural blind-spots. He says books from the future would also be great, but they are really hard to find. I like to think of the songs we write for our own congregations as the next best thing to songs from the future. The Living Creatures Project Was Born. God tells us to sing to Him with a new song. I believe He wants us to say things in our own words, from the perspective of our own communities, in the language of our specific missions. So I started writing songs for our congregation to sing; underlining the key ideas of our ministry by setting them to music. 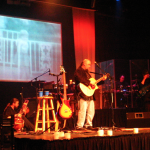 I received enormous amounts of encouragement from Pastor Bill Woolsey and Pastor Matt Popovits; the more original music I used in worship, the better. They would give feedback on how they thought the songs were received by the congregation, how easy they were to participate in singing. We would discuss the theological nuances of the songs, making sure they were Biblically sound and in line with our particular tribal understandings. 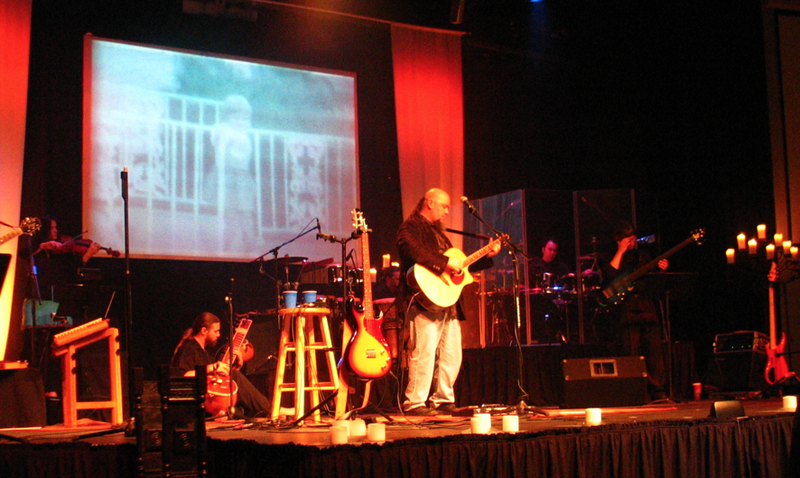 Many of the songs on the Living Creatures Project were written to go along with a particular message series or event that happened in our ministry. I thank God always for their kindness and support toward my ministry as a songwriter and their encouragement to record this music so people outside our community could enjoy it. When I told some friends who mostly know me from the Atomic Opera days that I was recording an album of the songs I had written for CrossPoint, I could tell they were rolling their eyes at the idea. As if I was selling my soul to the money changers in the church bookstore for 30 pieces of silver, or something equally evil and cheesy. They assumed I was destroying my musical legacy. I have enjoyed watching them unroll their eyes when they actually hear the music. Truly music to my post-jaded ears. The Living Creatures Project is twelve songs that have stood the test of time in ministry on the front line of the Great Commission. They are theologically rich, congregationally friendly, and forged in the furnace of classic rock.